It was right for Britain to decide to leave the EU but 48% of voters voted to remain. The Remain campaign’s half-truths and distortions convinced many. The remain side of the debate ultimately lost the referendum because people were not convinced by their false claims. Here are couple of these half-truths summarised and refuted. It was claimed that the free movement of people would be lost and that this would mean that British people would no longer be able to work in Europe. But the free movement of labour (as opposed to the free movement of people who can settle and have rights to benefits) is unlikely to change. It will be up to our elected British government to negotiate. But even if it did you could still go and work there and also go and work in China or Australia if you got work and a visa, as you can now. This is a total red herring. It was said to that we needed to be part of the EU’s single market because 44% of British exports were to the EU. But 44% of exports is down from 54% 10 years ago and going down fast. This means that looking to the future, the EU will become less and less important to our export trade. And being a member of the EU means we cannot negotiate trade deals with the 56% of exports (i.e. most of the exports!) which are with countries outside the EU. To remain in the EU would have continued to shrink our export market long term. And there is more: only 6% of companies in Britain trade with the EU but while we are in the EU 100% have to comply with EU regulations, even if these are different to the countries they actually trade with. Leaving the EU will free our companies to trade more effectively and in many cases drastically reduced their budget for compliance. 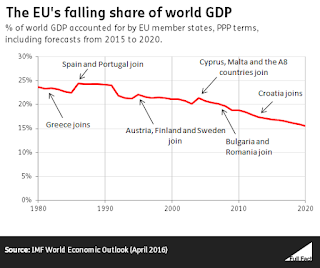 There is still more: the EU is the only trading bloc in the world whose economy is shrinking. 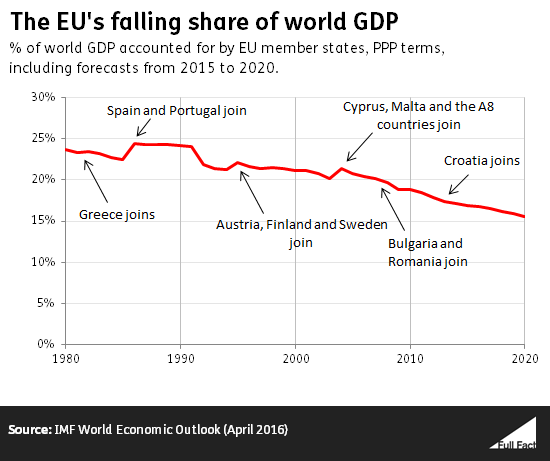 To put this in perspective, in 2013 the British Commonwealth's economy overtook the EU's economy. To stay trapped in the EU's customs union would have been to have our economy shrink with it.